Continue a traditional or rustic decor scheme in your lighting with this plug-in swing arm wall lamp with a beautiful Tiffany-style shade. It is perfectly topped by a hand-antiqued, saddle brown, faux leather bell shade. Tiffany lamps add a warm glow to your home. 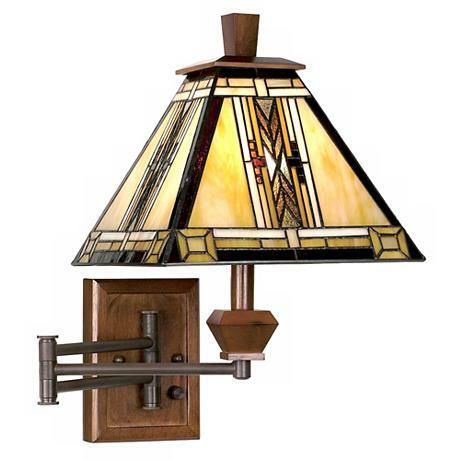 A walnut-stained wood finish gives this Tiffany-style swing arm lamp a soft look. A snap to install, simply mount to the wall and plug in to any standard wall outlet. Perfect by your bedside or next to your favorite reading chair. Features a full-range dimmer switch. • Uses one 60 watt bulb (not included). • Backplate measures 7" high, 5" wide. • Extends 23.5" from wall.